The most significant advances in cancer treatment start with a deep understanding of cancer biology; yet, even these biologically-driven hypotheses must be empirically validated given the complexity of the human body. This is why today immunotherapy treatments, which harness the power of our own immune systems, or targeted treatments, which directly tackle a genomic alteration in tumor DNA, hold so much promise for cancer patients, and why both of these important classes of treatments must be continually studied to optimize our understanding of which patients are most likely to benefit from these powerful medicines. While this empirical understanding almost always begins in controlled clinical trials, where scientists and researchers can carefully study the impact of a particular therapy, there are many other opportunities to learn about the science and efficacy of these treatments. At Foundation Medicine, we believe that genomic information gleaned from comprehensive genomic profiling (CGP) can help inform treatment options for patients today, while also accelerating our understanding of tumor biology and real-world outcomes to optimize effective treatment options for the patients of tomorrow. This opportunity to learn from real-world experiences is at the core of what makes broad access to CGP so powerful for oncology. At Foundation Medicine, we are now sequencing thousands of patients per week, and have been sequencing more tumor samples than any other single entity for several years. This has resulted in one of the largest consolidated genomic profiling knowledgebases in the country – nearly 300,000 cases – which reside in our FoundationCORE™ database. Research using FoundationCORE conducted by scientists at Foundation Medicine, in partnership with leading researchers in both academia and biopharma R&D groups, has led to more than 300 publications, presentations, and abstracts, helping accelerate our knowledge of genomics and oncology. The next frontier of discovery and impact will be reached by integrating genomic data with clinical outcomes, so we can understand which therapies work – or don’t work – for which patients, and how advanced biomarkers can help us predict that as early as possible. 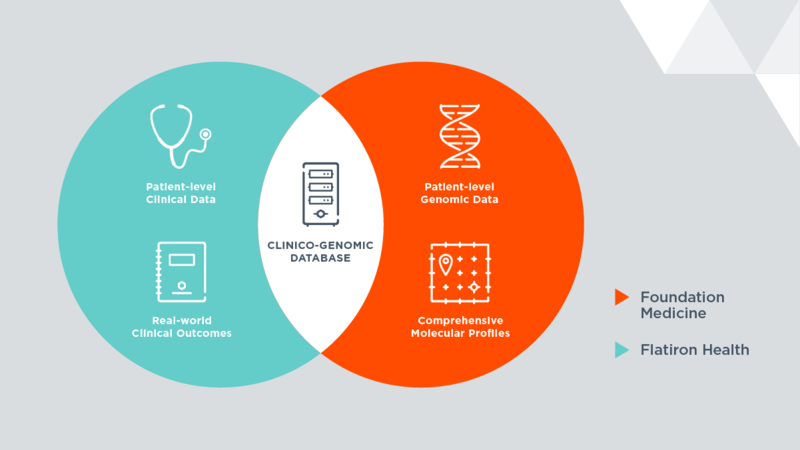 So, in 2016, we established a novel partnership with Flatiron Health to bring our world-class genomic database together with their leading real-world clinical outcomes data capabilities, creating a joint research platform, the “clinicogenomic database,” or CGDB. We’ve previously described some of our early work linking and validating this database at ASCO 2017, at that time, with a cohort of more than 2,000 non-small cell lung cancer (NSCLC) samples. Since then, we’ve grown this platform dramatically, and now have amassed nearly 50,000 linked, fully de-identified clinico-genomic records, which has already led to a number of new findings1,2,3,4,5,6 demonstrating early proof points that, indeed, this type of real-world data can accelerate our understanding of advanced cancer medicines and biomarkers. Looking forward, we envision broader and greater adoption of this novel methodology to advance many dimensions of science and research, especially as we conduct and publish additional validations of the scientific accuracy and reliability of analyses using these data. One particularly exciting opportunity is in optimizing the generation of carefully controlled research for modern clinical trials. Already challenging, expensive, and time intensive, clinical trials in the era of modern precision medicines have become nearly intractable; with patient populations sometimes as rare as less than 1%, hundreds of patients may need to be screened to understand the efficacy of a new therapy. Moreover, if these patients have specific, rare genomic characteristics, understanding how their course might differ from patients without that mutation, even in the absence of a new therapy, can be challenging, if not impossible, to predict. This understanding of how a “control group” would fare is essential to both trial design and interpretation of trial results, especially if having a randomized control group in the trial is not practical, as we’ve seen in some recent studies of medicines targeting rare biomarkers, or within rare cancers. As the entire healthcare ecosystem rallies around this important mission, a path forward is becoming clearer. In December 2018, the U.S. Food and Drug Administration (FDA) rolled out new guidance in support of using this real-world data to accelerate drug development and improve drug safety monitoring. And this approach is already making an impact, with the agency citing, “Real-world data and real-world evidence […] eliminated the need for postmarketing studies on nine potential safety issues involving five products, making our postmarket evaluation of safety timelier and more effective.”7 Realizing the value of regulatory-grade, validated datasets is a step forward in making its potential impact a reality. Ultimately, when a patient treatment decision hangs in the balance, we believe the bar for any analysis or diagnostic must be extremely high. When we launched our first CGP platform, FoundationOne, in 2012, we did so with an almost unprecedented level of scientific validation ultimately published in Nature Biotechnology,8 and set what we believe is the bar for such a decision-making tool. We believe that real-world datasets must be expected to meet that same high bar, because the impact will be no less great. With ongoing validation of datasets like the CGDB, and with broader uses and established proof points, we envision a day – in the not too distant future – in which carefully designed analyses of validated real-world datasets allow us to be smarter and more efficient in evaluating new medicines and accelerating their availability for patients who need them. To be sure, this will require careful examination of how the data were generated and validated, novel methods of development to control for the inherent confounders in observational, non-randomized data, and perhaps even forays into methodologies to understand causal relationships. While there is much work still to be done, it’s truly amazing to see how far we’ve come in even a few short years, and I’ve never been more excited about the opportunity in front of us. As a molecular insights company with the broadest view of genomic experience in the country, Foundation Medicine has the opportunity and, in my opinion, the responsibility to ensure that these datasets are advancing the field of oncology for patients and families, both those being treated today, and those who will need treatment in the future. I couldn’t be more proud to be part of shaping that future. 1 Singal G, Miller P, Agarwala V, et al. Development and Validation of a Real-World Clinico-Genomic Database. Oral presentation at: 2017 American Society of Clinical Oncology (ASCO) Conference; June 2017; Chicago, IL. 2 Singal G, Miller P, Agarwala V, et al. Analyzing biomarkers of cancer immunotherapy (CIT) response using a real-world clinico-genomic database. Poster discussion at: 2017 European Society for Medical Oncology (ESMO) Congress; September 2017; Madrid, Spain. 3 Singal G, Li G, Agarwala V, et al. Identification of resistance mechanisms to EGFR treatment in the real world using a clinicogenomic database. Poster presented at: 2018 American Association for Cancer Research (AACR) National Conference; April 2018; Chicago, IL. 4 O'Connell C, Backenroth D, Singal Get al. Prevalence of microsatellite instability and association with pembrolizumab (P) usage in a real-world clinico-genomic database. Publication at: 2018 American Society of Clinical Oncology (ASCO) Conference; June 2018; Chicago, IL. 5 Agarwala V, Backenroth D,Singal Get al. Identifying the prognostic significance of genomic alterations in a real-world, EHR-derived clinico-genomic database (CGDB). Publication at: 2018 American Society of Clinical Oncology (ASCO) Conference; June 2018; Chicago, IL. 6 Agarwala V, Khozin S, Singal Get al. Real-World Evidence In Support Of Precision Medicine: Clinico-Genomic Cancer Data As A Case Study.Health Affairs. May 2018;https://www.healthaffairs.org/doi/full/10.1377/hlthaff.2017.1579?url_ver=Z39.88-2003&rfr_id=ori%3Arid%3Acrossref.org&rfr_dat=cr_pub%3Dpubmed. Accessed April 8, 2019. 7 Statement from FDA Commissioner Scott Gottlieb, M.D., on FDA’s new strategic framework to advance use of real-world evidence to support development of drugs and biologics. US FDA website. https://www.fda.gov/NewsEvents/Newsroom/PressAnnouncements/ucm627760.htm. Published December 6, 2018. Accessed March 21, 2019. 8 Frampton, GM, Fichtenholtz, A., Otto, G., et al. (2013). Development and validation of a clinical cancer genomic profiling test based on massively parallel DNA sequencing. Nat Biotechnol, 31(11): 1023-1031. doi: 10.1038/nbt.2696.